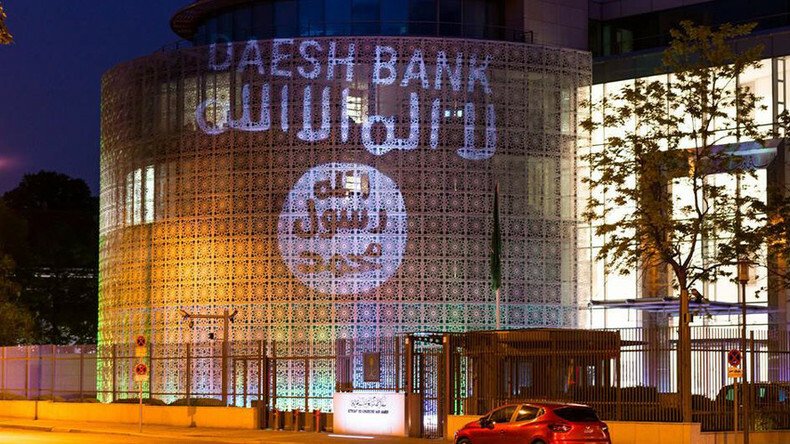 The embassy of Saudi Arabia in the German capital has been decorated with an ISIS flag and labeled the “Daesh Bank” in a projection stunt performed by human rights activists in an effort to draw attention to the kingdom’s purported links to terrorist organizations. Artist Oliver Bienkowski and the Pixel Helper collective performed the stunt to draw public attention to Saudi Arabia’s egregiously bad human rights record and country’s alleged support of extremist groups. Although Saudi Arabia plays one of the key roles in the US-led coalition aimed at eradicating Islamic State, the kingdom has faced criticism from its western allies for not making enough of an effort in the fight against terrorism. The kingdom has been regularly accused of supporting and financing various extremist groups serving their interests in the region. A 2009 memo published by WikiLeaks revealed that Hillary Clinton, who was back then the US Secretary of State, said that Saudi Arabia had been financing ISIS, Al-Qaeda and the Taliban. Saudi Arabia shrugged off the allegations, underscoring the initiatives it undertakes to prevent people from financing the terrorist groups. In the Syrian conflict, Saudi Arabia has been backing a group of opposition factions, some of which are known to be closely cooperating with internationally recognized terror groups like Al-Nusra and ISIS. 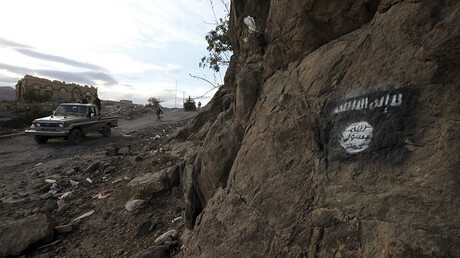 It is also commonly believed that Wahhabism, a strict form of Islam promoted inside Saudi Arabia as well as via its government programs abroad, has indirectly encouraged the rise of Islamic State. Another projection that lit up the walls of the embassy stated “10 years and 1000 slashes just for blogging #FREERAIF,” referring to the blogger Raif Badawi who was imprisoned for criticizing Saudi clerics and appealing for a more liberal and secular society in his blog. He has already spent four years behind the bars. The verdict triggered international concern for Badawi’s health and a wave of protests around the world. He went through a medical check-up after the first 50 lashes he received in January last year and was found unfit to have any more. The Saudi supreme court in June ruled, however, that the sentence upholds and the flogging could be resumed at any time. His wife, Ensaf Haidar, and three children were given shelter in Canada after they faced death threats back in Saudi Arabia. Together with Amnesty International they have been calling on Canadian Prime Minister Trudeau to ask for Badawi’s release. In 2015 Badawi was awarded the Sakharov Prize for Freedom of Thought from the European Parliament.